My First Trophy – Like Ever! Seriously, though – I’ve entered many contests or competitions, and I have actually won things before. I’ve won t-shirts, gift certificates, money, and of course, ribbons at horse shows. But I have never won a trophy before. My husband has won trophies- both in horse shows and car shows. He’s even won medallions at a horse show, which were SUuuupper cool. 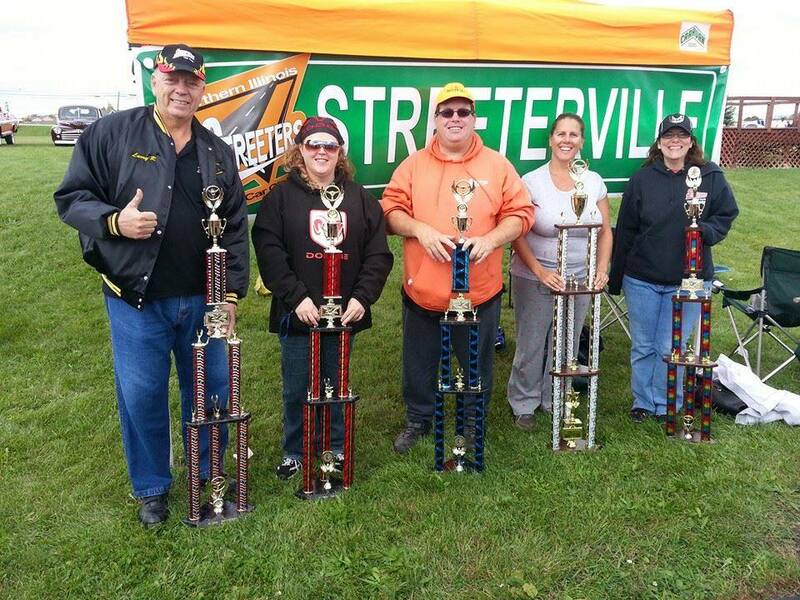 Of course, my husband has racked up the trophies at car shows. This around, though, it was my turn! Well, Ok, his too. We went to a car show this past weekend, which is a fun and different car show. Yes, you bring your cars, but the competition is actually for the food. The entrants all bring food dishes and the 100+ people there all get a great buffet for free lunch, and then vote. And, for a first trophy being almost as tall as I am, it was pretty cool to win! It was really neat!! In fact, all 5 trophies at the show were won by members of the car club we all belong to. My husband is in the orange, of course. I’m in the gray. The categories were best appetizer, dessert, salad, casserole, and best of show. My husband’s dish was his “world famous” sauerkraut and keilbasa, marinated in apple juice and glazed in brown sugar. Yes, it is as good as it sounds. He won the best casserole. We both were entered in the casserole class, so when he won first, I figured it was all over, lol! I actually won best of SHOW! Woot woot! I made a chicken, potato, and bacon casserole (from a recipe I found on Facebook), and I was SHOCKED that it was awarded best out of all the dishes!! 2 weeks to go to Chewbacca’s last show of 2013. Can’t wait! This entry was posted in Uncategorized and tagged car show, chicken, trophy. Bookmark the permalink. 1 Response to My First Trophy – Like Ever! Congratulations!!! Those are some huge trophies, LOL. But I gotta tell you, unless those are are “secret” recipes, I sure would like to have them ‘cuz they sound delish! Even if your husband doesn’t want to share, I’d be tickled to get yours (riderwriter13 at gmail dot com). Looking forward to hearing about your and Chewie’s big event!